Does Ristras hit the SPOT? This no-frills, pricey Mexican cantina fails to live up to all the hype. 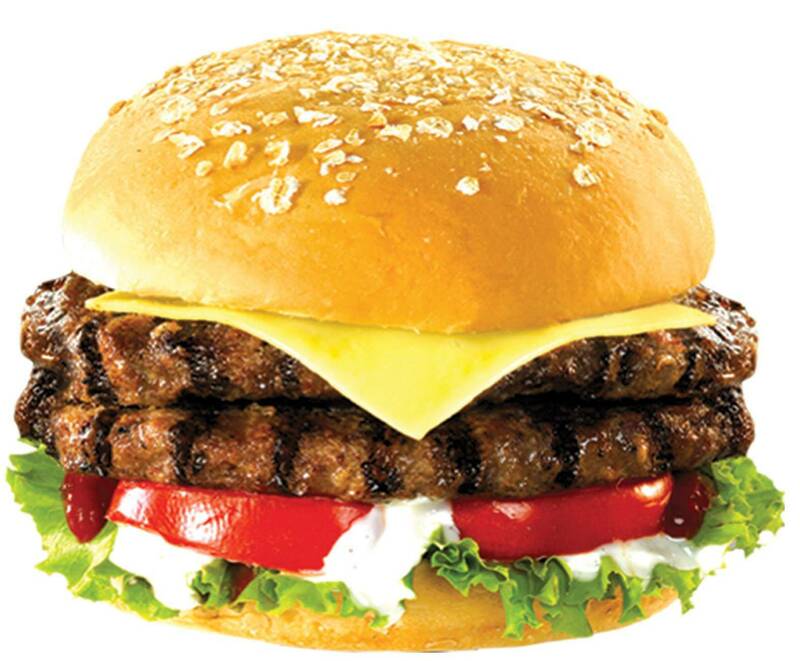 Compared to burger joints, there are only a handful of Mexican restaurants in Manila-an odd fact, since eating Mexican has plenty of similarities to eating burgers. You eat both with your hands, and like fries are to burgers, nachos are the perfect complement to a good burrito. Not to mention the fact that both go equally well with a cold bottle of beer. So the opening of Ristras, a small Mexican cantina on J. Abad Santos, just off Wilson Street in San Juan, was met with equal parts curiosity and anticipation. SPOT.ph went on a sunny Monday to find out if the food was realmente bueno. WHAT WE ORDERED: The tacos (P290) come in a basket of three, so bring friends to share with if you don’t have a large appetite. Tip: the crunchy-shelled tacos are easier to eat than the soft-shelled ones, which they just fold into half after piling on the ingredients-it’s almost guaranteed to be a messy affair, so don’t order it if you’re on a first date. 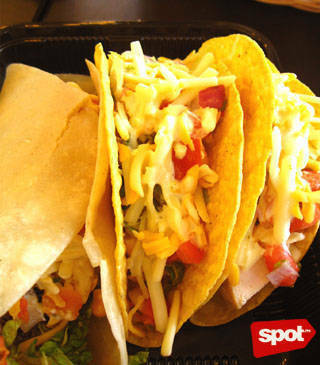 Diners can choose the main ingredient (chicken, pork, beef, vegetarian), but not the rest of the taco fixings. After you choose chicken, pork, or beef, they’ll add a salsa with tomatoes, red onions, cilantro, and corn kernels, a vinegar-like sauce, and what we guessed was sour cream. Better to repeat your order at least three times; the waiter gave us the barbacoa (shredded beef) instead of the steak, which we only realized after a few bites since it was buried in salsa. 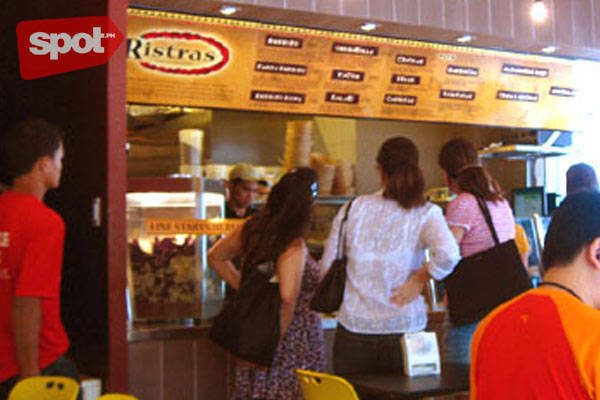 Ristras’ burritos (P290) can be ordered in three ways too: you can get a Fajita Burrito, a Burrito Bowl or the normal burrito, wrapped in either regular tortilla or whole wheat tortilla. On the day we went, the whole wheat tortilla wasn’t available so the server went ahead and prepared the burrito by piling on generous amounts of beans (choice of black or green), rice (cilantro or chorizo rice) and filling (chicken, barbacoa or shredded beef, carnitas or pork, steak or vegetarian). Other add-ons include guacamole, bell peppers and onions and jalapeno.You may also customize the spice level of your burrito with the chili (choice of red or green). Filling and hearty but not overwhelmingly impressive, the huge burrito may be shared and is served with salsa. The Sugarcane Lemonade (P90 for medium, P125 for large) has an unexpected taste that didn’t necessarily go well with the food, the lemonade’s sour-bitter combination overpowering any hint of sweetness from the sugarcane. Of the different types of nacho dishes listed on their menu, the Nine Layer Dip (P255) was recommended over the Ball Park Nachos (P255), because, the waitress said, the nachos usually got soggy in the latter. Unfortunately, the nachos we got weren’t very crispy, and the nine-layer dip was mostly made up of the same salsa that went into the tacos. Cheese would’ve been a big help. 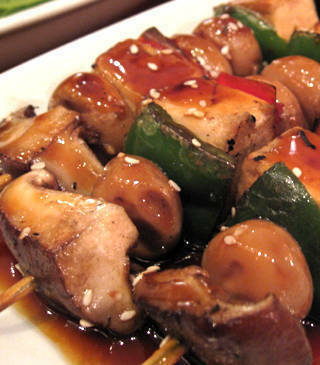 The vegetarian in your group will be satisfied, but perhaps may not gush, especially over the price (P290!) of the Salad consisting of shredded romaine lettuce with a choice of beans, meat, salsa, or cheese (we chose salsa); topped with your choice of the main ingredient (chicken, pork, beef, or vegetarian). The vegetarian topping was generous, with lots of shredded cheddar, chillies, black olive slices, tomatoes, vegetarian black beans, sautéed peppers and onions and freshly made guacamole in one big happy mess of a heap. The cilantro-lime dressing was just the right dose of tangy-tart-sweetness to bind the vegetable carambola together, so even if we were alarmed when the server kept slathering more and more dressing despite our protests for him to stop, we must admit he did know better. WHEN TO GO: The place got pretty busy during lunch on a Monday, so beat the crowd by going before noon to snag a parking space on the side street. 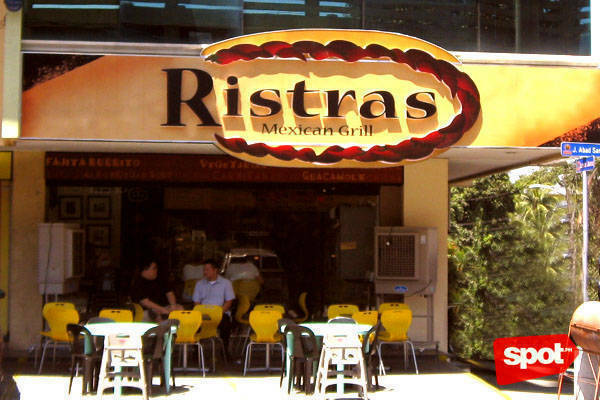 WHAT WE THINK: Ristras is fine as a quick fix if you’re craving Mexican and happen to be in the area, but the flavor of the food, considering their prices (our bill was P1,625 for four people!) makes us think twice about going back. Also, while we know that all new restaurants have birthing pains, they could definitely step up the quality and speed of their service. There doesn’t seem to be an efficient division-of-labor system in place after having existed for four months. After waiting in vain at our table to get the attention of one of the more than seven servers behind the counter, we gave up and carried all out leftovers to the counter ourselves. Then we had to wait for more than five minutes for them to wrap up half a burrito, a taco and nachos with dip, for us to take home. Ristras is located at J. Abad Santos corner Lopez Jaena, San Juan. Does Lorenzo's Way hit the SPOT?